The Faber-Castell Ambition Black Mechanical pencil is all about clarity, a feeling for materials and fresh vibrant colors. The clean lines and selecte.. The Faber-Castell Ambition Metal Mechanical pencil is all about clarity, a feeling for materials and fresh vibrant colors. The clean lines and selecte.. The Faber-Castell Ambition Coconut Mechanical pencil is all about clarity, a feeling for materials and fresh vibrant colors. The clean lines and selec.. The Faber-Castell Ambition Rhombus Black Ballpoint is all about clarity, a feeling for materials and fresh vibrant colors. The clean lines and se.. The Faber-Castell Ambition Rhombus Black Rollerball is all about clarity, a feeling for materials and fresh vibrant colors. The clean lines and s.. The Faber-Castell Ambition Rhombus Black Mechanical pencil is all about clarity, a feeling for materials and fresh vibrant colors. The clean lines and selected materials of these slim writing instruments make an excellent impression. They are distinguished by clear-cut visual design combined with professional functionalism. The Faber-Castell Ambition range is available in precious resin, coconut wood, pearwood and stainless steel. The Faber-Castell Ambition pens are available as mechanical pencils, ballpoint, rollerball pens and fountain pen. The mechanical pencil uses 0.7mm leads. Mechanical pencil lead for drawing on almost any surface. Available in various degrees and line widths. The pencil leads are packed in a plastic box p.. 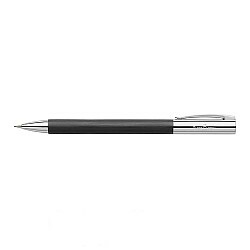 The Faber-Castell Ambition Black Ballpoint is all about clarity, a feeling for materials and fresh vibrant colors. The clean lines and selected materi.. The Faber-Castell Ambition Black Rollerball is all about clarity, a feeling for materials and fresh vibrant colors. The clean lines and selected mater..